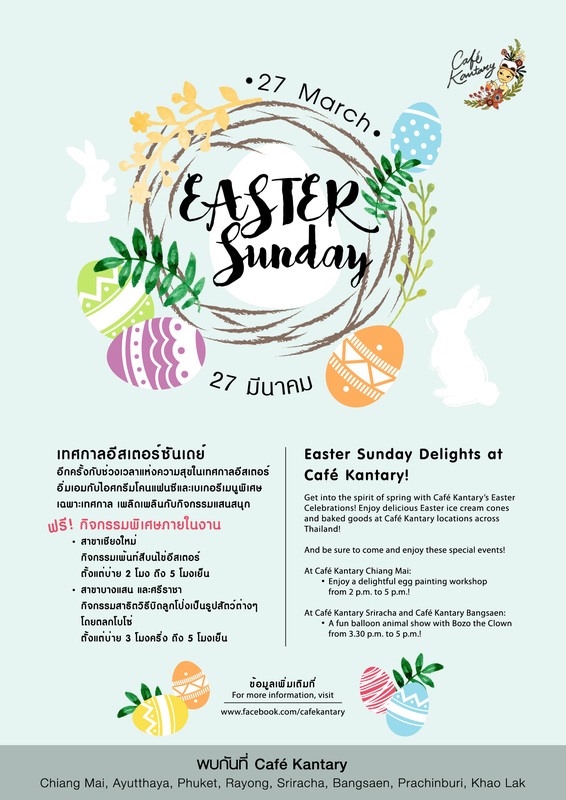 27 March 2016, get into the spirit of spring with Café Kantary’s Easter celebrations and enjoy delicious Easter icecream cones and baked goods at Café Kantary locations across Thailand and be sure to come and enjoy these special events. At Café Kantary Chiang Mai: Enjoy a delightful egg painting workshop from 2 p.m. to 5 p.m.
At Café Kantary Sriracha and Café Kantary Bangsaen: A fun balloon animal show with Bozo the clown from 3.30 p.m. to 5 p.m. Enjoy icecream cone and bakery available at Café Kantary all locations: Chiang Mai, Ayutthaya, Rayong, Khao Lak, Phuket, Bangsaen, Prachinburi and Sriracha. วันที่ 14 มีนาคม 2559 เวลา 11:19 น.